Successfully Added Bar Phone “Vogue S6” - Quad Band GSM, Dual SIM, 2600mAh Battery, Bluetooth, 2.4 Inch Screen, Flashlight, Camera (Yellow) to your Shopping Cart. The “Vogue S6” bar phone is a simple and sturdy device for everyday use. Perfect for anyone who’s looking for basic functions, simple interface and large easy-to-press buttons. The "Vogue S6" doesn’t come with hundreds of apps or flashy gimmicks, it doesn’t need them. This phone has a minimalist approach and focuses on the main function you need from a mobile, reliability, sturdiness and above all the ability to make and receive calls and messages. With Dual SIM slots each of which supports Quad Band GSM frequencies you get comprehensive cover through most of the globe and can swap between SIM cards without opening the phone each time, which is great if you travel a lot as you can have domestic cards for different regions to save on those roaming charges. Having a tough exterior with easy to grip edges and a solid dial pad with buttons that are of a size that makes them easy to use the “Vogue S6” is great in the wet outdoors, with cold fingers or for use in harsh conditions. This simple, easy to use phone is an attractive option to those who struggle to read small print or use the small keyboards of a touch screen, while the loud speaker and straight forward interface are easy to master. All this makes the Vogue S6 a great option for those who long for a simpler communication experience. 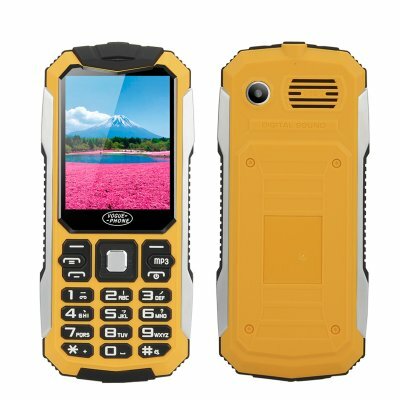 The tough and robust "Vogue S6" phone has a study build and comes with a 2600mAh battery, which brings it up to 8 hours of continuous usage time or around 100 hours of standby so its perfect for the outdoors enthusiast, campers, hikers as well as anyone who wants a phone that can withstand the accidental drops and bumps that put so many other devices out of commission. With modern smartphones getting more and more complex, the “Vogue S6” Phone is an excellent choice for senior citizens or outdoor adventures who are looking for simplicity, clarity and reliability from their mobile devices. The “Vogue S6” Bar Phone comes with 12 months warranty. Brought to you by the leader in electronic devices as well as wholesale bar phones, Chinavasion..